Why “stone” water jars at the wedding in Cana of Galilee? Travelling from Nazareth to the Sea of Galilee we pass through Cana in Galilee where according to the New Testament Scriptures Jesus changed six “stone” jars of water to wine at the wedding. What did they actually LOOK like and WHY does the Bible stipulate they were made out of “stone” rather than the usual clay pottery? Cana: Biblical stone water jar discovered beneath the Jewish Quarter in Jerusalem’s Old City. 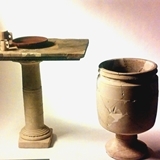 Dear friends, Many of heard about biblical stone water jars, but how many of actually SEEN one? We read about them in the New Testament in connection to a Jewish wedding in Cana where Jesus changes water to wine: “On the third day a wedding took place at Cana in Galilee… Nearby stood six stone water jars, the kind used by the Jews for ceremonial washing, each holding from twenty to thirty gallons.” (John 2:1-6). Well, here’s the real McCoy, discovered in an excavation, some 15 feet below the Jewish Quarter in the Old City of Jerusalem. The stone water jar was carved and polished by hand out of one chunk of limestone and stood inside a 7500 sq. foot palatial home and probably belonged to a wealthy Cohen (priestly) Jewish family who lived in Jerusalem at the time of Jesus – when the Temple was still standing. Why made out of stone? If on the other hand the water container was made of ceramic (rather than stone) it could be rendered ritually impure, as would the water itself AND the priest that used it! This was no small matter, for in such a state of ritual impurity a priest (such as Zachariah, father of John the Baptist) couldn’t serve in the Jerusalem Temple or eat of the holy sacrifices and offerings that pilgrims brought! So getting back to the story of the “six stone water jars” mentioned in John 2, if you were a wedding hall owner in Galilee 2000 years ago and wanted your clients to be able to invite their priest friends to the reception, you’d invest in a set of expensive stone vessels (rather than cheaper ceramic). Of course it would cost more, but hey, one doesn’t get married everyday (hopefully) and you’d want your wedding reception clients to be able to invite all of their friends, including clergy priest friends to celebrate, eat, drink, and be merry! Visit Israel, Cana in Galilee, & see the stone water jar! I invite you to join me in Israel, visit Cana in Galilee, see an authentic biblical stone water jar, and learn more about biblical weddings and marriage. This entry was posted in Galilee and tagged cana, Cana in Galilee, cana wedding, Jesus changes water to wine, John 2:1-6, stone water jar by zshavin. Bookmark the permalink.